All the Works of Dr. Jayant Ba!aji Athavale &amp;amp; Dr. (Mrs.) Kunda Jayant Athavale deal with the doctrine and practice of spirituality &amp;amp; are thoroughly comprehensive. They cover all the conceivable facts and are substantiated with his deep study and guide a layman, a 'man on the path' or a devotee inspiring him to hold on more devotedly to the path of righteousness. Dr. Jayant with His life-partner Dr. Kunda has co-authored books on spirituality which are translated in many languages. He started his main missionary work to enlighten the aspirants in the State of Maharashtra. His mission has now started spreading its wings over very many States by opening the Centres of Spirituality all over India. He has a large following of aspirants from all walks of life in India as well as Abroad. His Spiritual master, the late Shrirnat Sadguru Bhaktaraj Maharaj accepted Dr. Athavale &amp;amp; His Wife's humble &amp;amp; yet erudite discipleship and bestowed all the gifts of spiritual knowledge &amp;amp; practice upon both of them lavishly. As a result, this couple now runs a society named 'Sanatan Bharatiya Sanskruti Sanstha'. It has Centres galore &amp;amp; carryon the work of spreading the scientifically correct knowledge of spirituality. All their lectures, researches, books and pamphlets are full of 'ever new' vibes that they receive during their course of spiritual study &amp;amp; meditational practice. The word 'Sanatan' means 'Ever New' &amp;amp; this is what is really needed by the present society in every clime and time. 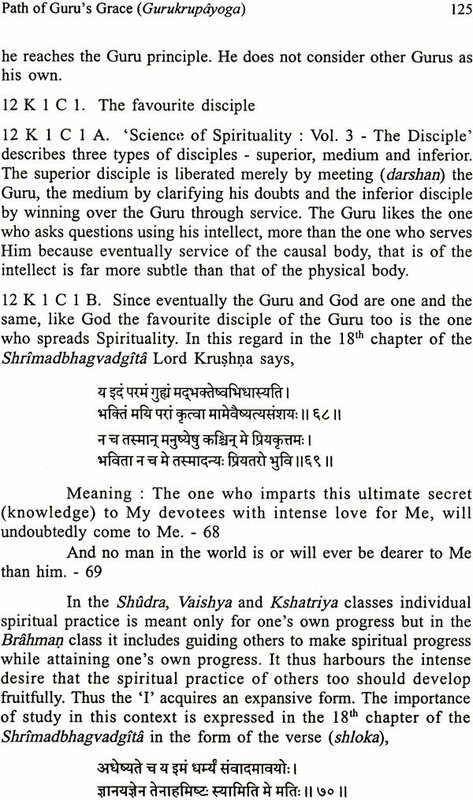 Meaning : Only by the grace of the Guru can the disciple attain his ultimate benefaction, that is spiritual progress ..
Once when we were with our Sadguru H.H. Bhaktaraj Maharaj (Baba) in Indore, Baba said, "The Path of Devotion (Bhaktiyoga) is the best among all paths (yogiis) 'in Spirituality". We had the audacity to reply, "No, Baba the Path of Guru's Grace (Gumkmpayoga) is supreme." Baba was overjoyed and said, "You are absolutely right l"
Seekers who have practiced Spirituality through various paths for several years and not progressed beyond a particular spiritual level yearn to attain the Guru's grace. On the other hand seekers who have made spiritual progress by the grace of the Guru get spiritual experiences to prove the absolute supremacy of this path. One cannot perceive the special features of a Guru by looking at His gross body with ordinary vision. 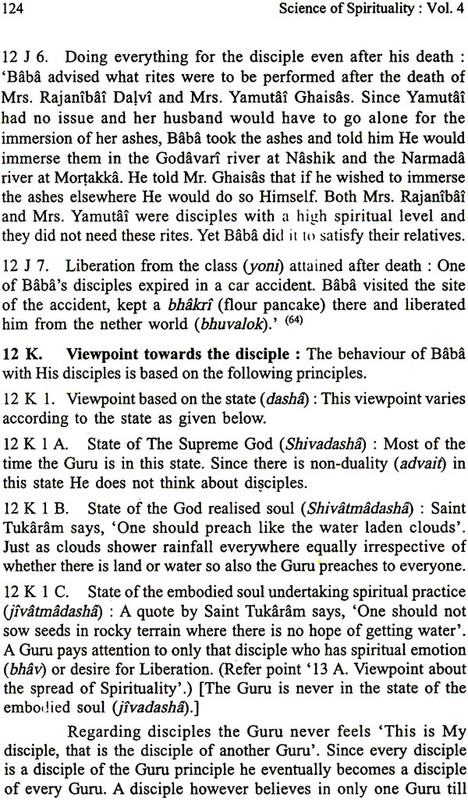 That is why this book describes the qualities of a Guru, His teaching a disciple both verbally as well as through a dimension beyond words, the Guru-disciple relationship, the all pervading nature of the Guru from His point of view, His behavior like an average person, His behaviour with other saints, the Guru hierarchy, the importance of India in the context of Gurus, etc. 15 Does the Guru really do something?